And here we are with barely ten days to Christmas, with a very seasonal post for you! For the English, Christmas means Pantomime season, and panto is so much a part of the national psyche that for me it was a real surprise to find out that they don’t do pantomime all over the world, but apparently so. For those of you who have never experienced the madness of panto, you are about to meet one of the great phenomena of Englishness… If you haven’t a clue what we’re on about, shout and we’ll explain what pantomime is and what the conventions are! So without further ado (and not too much heckling from the back), let me hand over to Lexi who will introduce the main character’s for tonight’s entertainment…. It’s the pantomime season – who were the heroes, villains and pantomime dames of the literary world in 2011? It’s a matter of opinion, so take your pick from the following suggestions. Look out, he’s BEHIND you! Amazon is the big bad villain, twirling his moustache and swirling his cape. Counts against him this year: stealing the livelihood of bookshops (many of them small, local and independent), seducing innocent young indies with the evil KDP Select scheme, banning innocuous authors from their forums, and generally attempting world dominance in a manner worthy of a Bond villain. Publishers had never noticed indies were making them money, until nasty Amazon wanted to keep them all to itself. Boo! In November, famously nice Michael Palin criticized Amazon – nuff said. And swarming behind Amazon, alarming many a blogger, are the Orc-like hordes of self-publishers, who have the temerity to seek readers – even though they have been told frequently by the gatekeepers to Go Away, their writing is Not Good Enough, and certainly can’t compete with the likes of Katie Price or Pippa Middleton. They are also known as the Tsunami of Crap, through which desperate readers will be forced to wade in search of a decent read. Cinderella: she is every indie author with a good book the traditional publishing industry won’t touch, drooping disconsolately and patronized by passing literary agents. She keeps writing because she has to. Wash off the cinders, and she does not look all that different from the lucky elite who do have invitations to the publishing ball. Fairy Godmother: the Kindle, without which Cinderella would not have been able to go to the ball. There are other, lesser fairies around, but their light is dimmed by Fairy Kindle. Watch out for Fairy Fire, surely coming soon to the UK, Fairy Nook, and Fairy Kobo, to be found in WH Smith’s. Buttons: Mark Coker, proprietor of Smashwords, helping Cinders with her chores, wanting to share his humble home with her, but ultimately not offering anything like as much as the Prince. Whoever that character was who offered Jack five beans in exchange for his cow: Penguin, with their scheme to take advantage of indie authors by volunteering to format and load their books to KDP for a mere $549 plus 30% of their profits in perpetuity. And Penguin’s beans won’t turn out to be magic, either. 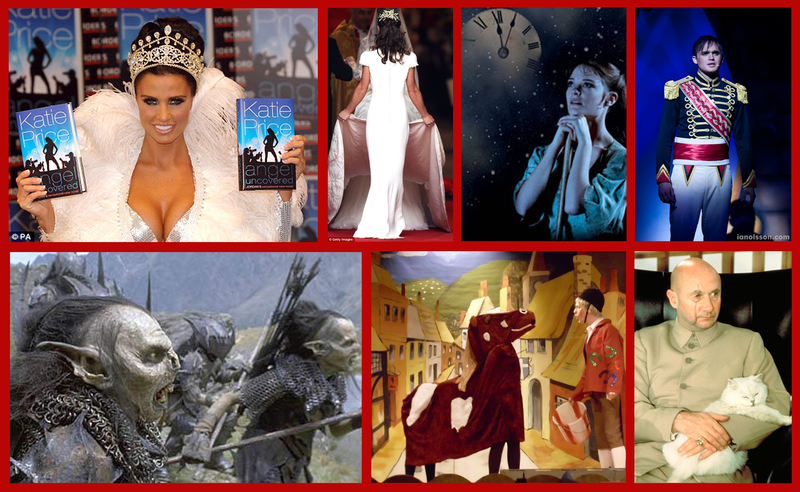 Pantomime dame: Katie Price, best selling novelist, an ornament to Random House’s author list. Pantomime horse: Authonomy, which some of us believed was a racehorse when it first appeared. We were wrong. Sorry, Scott Pack, but does anyone take it seriously any more? What, exactly, has it achieved in three years, except to waste a great deal of its members time? Do you agree with my choices – have I missed anyone? Whom would you suggest? So, what do you think? Do you agree, disagree, or need explanation? Many thanks to Lexi for that, and do weigh in and let us know who your own candidates would be! Hey, Phil, this won’t do – you’re supposed to argue, not agree with me! How else can we get into “Oh no it isn’t!” and “Oh yes it is!” in the proper manner? Well now I know what the collage of pics you have on your blog represent! LOL! Ha! That is excellent. I love the bean merchant. They say that the cream will always rise to the surface but so does scum and it often ends up on top of the cream. I believe it was ever thus, I know what I should be doing, I should be saying sod the K’Barthan trilogy and ghostwriting Katie’s book. Sure she’ll get the money but at least I’ll get to see my work published by a publisher. I had a brilliant idea while on Authonomy of starting a business matching talented unpublished authors with celebrities who fancied having a book in the bookshops, doing signings, having the cachet of writing etc.. The celebrity could pick a novel of his/her choice from a wide range, and split the profits with the author.